I suppose it's rather fitting that I re-read The Grey King over a weekend while I was sick with a cold, as the book (the fourth in The Dark is Rising series) opens with Will Stanton recovering from a bout of hepatitis. This is by no means my favourite in the series - the first three will always be the dearest to me - but it's still delightful. This time Will travels to Wales in the autumn to recover from his sickness at an aunt and uncle's, but his real reason for going is to find the magic harp that will wake "the Sleepers" and aid the Light on their quest against the rising forced of the Dark. Will ends up befriending an albino boy named Bran, who plays a significant part in the quest. 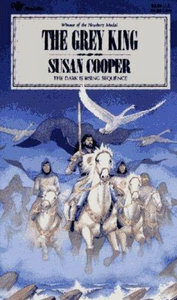 What I love about these novels is that even though they're fantasy, what they really feel like are a love letter to the parts of Britain Susan Cooper is describing: the farmlands of Buckinghamshire, the seacoasts of Cornwall, the mountains of Wales. Her language is beautiful; it's haunting, and even without the fantasy elements you would have five lovely, evocative novels. Not only did I feel I was in Northern Wales, I actually felt like I was part of the landscape. It's a slim novel, almost a novella, but it adds to the building tension of the previous novels. I look forward to reading the next and last.